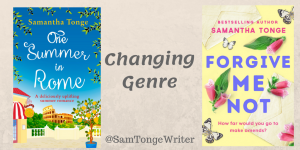 Have you ever considered changing genre? I hadn’t before last year when the decision was taken out of my hands. My debut women’s fiction novel, Forgive Me Not, is out two weeks today. It’s my tenth book. The other nine are romcoms, the latest being One Summer in Rome, all of them published under the wonderful HarperCollins umbrella. I now have a new publisher, the amazing Canelo – so also a new editor. After all most five years of being a published author this is quite a change. Next week I’ll be blogging about the mental health challenges I’ve faced over the last couple of years that brought about this new direction. I reached a point where I said to my agent I just don’t think I can write romantic comedy any more. It’s not in me. The spark has gone. Deep within I felt a seriousness, a weight, even though my mental health was improving. And a kind of clarity that something inside me had shifted and my writing needed to reflect that. That’s the thing. Us authors write from the heart. I’ve passionately written all of those nine previous books but just didn’t have the same motivation as the weeks became months in 2017. It would have been impossible. Which is kind of ironic as I’d always thought of myself as a very commercially-minded author, but if you’d offered me a million pounds I couldn’t have come up with the goods. However I did have an idea for a book with characters I could relate to. A mental health problem can create turmoil within a family – and with friends and sometimes the community, as is the case with the protagonist Emma in Forgive Me Not… before I knew it I’d sketched out character profiles and a plot. But the story wasn’t funny. The main thrust of it wasn’t romantic. I wasn’t sure how my writing style would fit this new genre. I wasn’t sure if I was up to writing in a new way with no one-liners, nor a humorous tone. I didn’t know if my readers would follow me along my new path. But I had to do it. So with the guidance of my incredible agent I started. And it was tough. The first draft virtually needed to be scratched and I almost gave up. But a writer’s heart is a powerful tool. It kept nudging me and eventually I began again with renewed passion. It was a nerve-wracking process sending out the manuscript to editors and a particularly emotional moment came when I read the email in which my new editor, Michael Bhaskar, expressed his passion for, and belief in, my new project. With his expertise the manuscript was polished further. When I saw the fantastic cover the Canelo team created everything fell into place and I felt that this genre was where my work – at the moment anyway – should be. Now the whole creative process for that story is over I can see that the new book is still “me”. I feel there’s an underlying warmth that is the signature of my previous books. 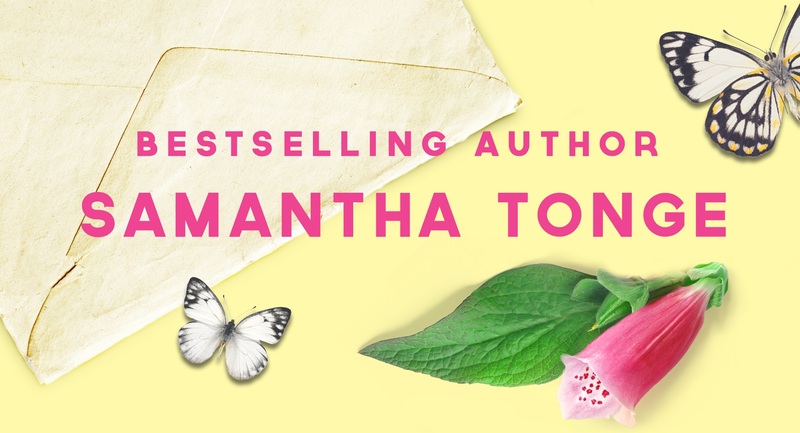 And I’m absolutely thrilled with the early reactions I’ve had to Emma’s story. It’s early days but perhaps this is going to go okay! So, I guess what I’m saying is, don’t be afraid to follow your heart. I’ve always believed that someone’s greatest achievements don’t come from the comfort zone and that an author must continually set themselves challenges. It is too easy to become complacent, especially if you find a degree of success. Although that doesn’t necessarily mean changing genre – for example, in One Summer In Rome a character is blind, and it took research and care to write their story. And my author friends and favourite writers never cease to amaze me with the innovative story after story they come up with. It’s been a scary twelve months. I’m an author with bills to pay, it’s my career, and I have a lovely loyal readership for my comedy writing. One might say this change of direction is something of a risk. Yet I feel it’s too easy to become pigeon-holed as a writer. I recently attended an evening with Matt Haig who has written fiction, non-fiction, children’s stories… and I find that very inspiring. I’ve written many stories from a child’s point of view for The People’s Friend magazine and have often felt a hankering to write a novel for youngsters. And now I’m thinking well… why not? Humans change over time – I’m not the same person I was twenty, ten, five or even two years ago – so it’s perhaps, naive, to expect our writing not to change as well. This entry was tagged amwriting. books, Canelo, Forgive Me Not, genre, harpercollins, Matt Haig, mental health, one summer in rome, romance, romantic comedy, women's fiction, writing.